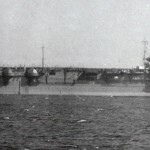 The Japanese Aircraft Carrier Shokaku. 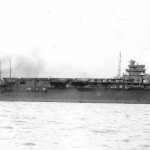 The Shokaku and Zuikaku were probably the most active Japanese Aircraft carriers during the Pacific War and were involved in the most relevant battles. The Shokaku was commissioned on August 8, 1941 and together with her sister Zuikaku formed the Carrier Division 5 and performed a short period of intense training in preparation for the Pearl Harbor attack. The Shokaku carried 84 planes and was sunk by American submarine USS Cavalla on 19 June 1944. The Shokaku aircraft carrier illustrated in Fujimi model kit box. The Zuikaku was commissioned on September 25, 1941 and also carried 84 planes. She was sunk by air attack in the Battle of Leyte Gulf on 25 October 1944. The Zuikaku aircraft carrier illustrated in the Premium Quality Fujimi model kit box. They formed the 5th Carrier Division assisted by the Oboro, Akigumo destroyers. Models shown are from the art box of the Fujimi model kit.